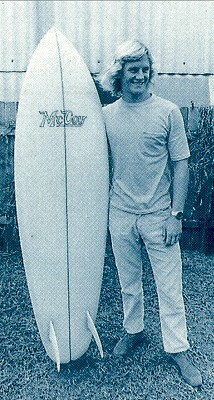 1971 McCoy Twin fin I 6 ft 4"
Foam blank with 1/8'' plywood stringer, Volan glassed with tint laminate on the deck. 1/2'' rail lap and double foil deck/tail patches, fin patches. 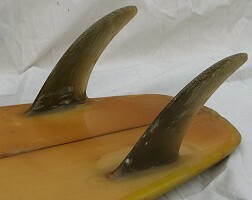 Bottom: flat, slight Vee behind the fins. 6" x 4 1/2" base x 8 1/2'' span @ 6 1/2''. Not tipped out, or very slight. Extensive fin base repair to left fin..
Possible further markings on the pod. 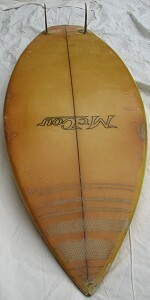 Board added to surfresearch collection March 2008. Item originally purchased from a used goods dealer, Pacific Highway Coffs Harbour NSW circa 2002. The length and foiled deck line without a thick chamfered pod probably indicates a later version on this design, perhaps even a "gunned" model. 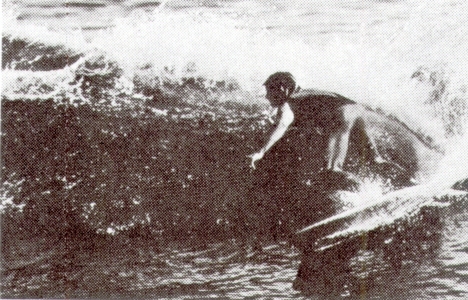 Compare and contrast with McCoy Twinfin #318.